Modern web applications are becoming more and complex. Users are often greeted with an experience that is both reactive and engaging. Pages update in real time without the user having to initiate calls to the server or refreshing their browser. In the early days, developers relied on AJAX requests to create applications that were pretty close to realtime. Now they&apos;re able to use the power of WebSockets to create fully realtime applications. Each HTTP request/response connection is closed after the response and to get any new information another connection must be made. The server has no idea the client is looking for new information without a new request to tell it so. One technique to make AJAX applications seem realtime is to run AJAX requests in a timed loop. After a set interval, the application can rerun a request to the server to see if there has been any update which needs to be reflected in the browser. This works fine for small applications but is not very efficient. This is where WebSockets come in handy. WebSockets are part of a prosposed standard created by the Internet Engineering Task Force (IETF). The full specification of how WebSockets should be implemented are detailed in RFC6455. Here is how the document defines a WebSocket. In other words, a WebSocket is a connection that is always open and allows a client and server to send messages back and forth unprompted. The server can push new information to the client whenever it deems it necessary and the client can do the same to the server. The only argument you need is a URL to where the WebSocket connection is going to be accepted by the server. The request is actually an HTTP request initially but we use "ws://" or "wss://" for a secure connection. This lets the server know that we are trying to create a new WebSocket connection. The server will then "upgrade" the connection to a persistent two-way connection between the client and server. Once a new WebSocket object is created and the connected is successfully created we can use the "send()" method to send text to the server and define a handler function on our WebSocket&apos;s "onmessage" property to do something with messages sent from the server. This will be explained later in our chat application code. WebSockets are not included as part of the Go standard library but thankfully there are a few nice third-party packages that make working with WebSockets a breeze. In this example we will use a package called "gorilla/websocket" which is part of the popular Gorilla Toolkit collection of packages for creating web applications in Go. To install it, simply run the following. The first part of the application is some setup. We start our application like all Go applications and define our package namespace, in this case "main". Next we import some useful packages. "log" and "net/http" are both part of the standard library and will be used to log (duh) and create a simple HTTP server. The final package, "github.com/gorilla/websocket", will help us easily create and work with our WebSocket connections. The next two lines are some global variables that will be used by the rest of the app. Global variables are usually a bad practice but we will use them this time for simplicity. The first variable is a map where the key is actually a pointer to a WebSocket. The value is just a boolean. The value isn&apos;t actually needed but we are using a map because it is easier than an array to append and delete items. The second variable is a channel that will act as a queue for messages sent by clients. Later in the code, we will define a goroutine to read new messages from the channel and then send them to the other clients connected to the server. Next we create an instance of an upgrader. This is just an object with methods for taking a normal HTTP connection and upgrading it to a WebSocket as we&apos;ll see later in the code. Finally we&apos;ll define an object to hold our messages. It&apos;s a simple struct with some string attributes for an email address, a username and the actual message. We&apos;ll use the email to display a unique avatar provided by the popular Gravatar service. The text surrounded by backticks is just metadata which helps Go serialize and unserialize the Message object to and from JSON. The next route we want to define is "/ws" which is where we will handle any requests for initiating a WebSocket. We pass it the name of a function called "handleConnections" which we will define later. Finally, we print a helpful message to the console and start the webserver. If there are any errors we log them and exit the application. Next we need to create the function to handle our incoming WebSocket connections. First we use the upgrader&apos;s "Upgrade()" method to change our initial GET request to a full on WebSocket. If there is an error, we log it but don&apos;t exit. Also take note of the defer statement. This is neat way to let Go know to close out our WebSocket connection when the function returns. This saves us from writing multiple "Close()" statements depending on how the function returns. Next we register our new client by adding it to the global "clients" map we created earlier. The final piece is an inifinite loop that continuously waits for a new message to be written to the WebSocket, unserializes it from JSON to a Message object and then throws it into the broadcast channel. Our "handleMessages()" goroutine can then take it can send it to everyone else that is connected. If there is some kind of error with reading from the socket, we assume the client has disconnected for some reason or another. We log the error and remove that client from our global "clients" map so we don&apos;t try to read from or send new messages to that client. Another thing to note is that HTTP route handler functions are run as goroutines. This allows the HTTP server to handle multiple incoming connections without having to wait for another connection to finish. The final piece of the server is the "handleMessages()" function. This is simply a loop that continuously reads from the "broadcast" channel and then relays the message to all of our clients over their respective WebSocket connection. Again, if there is an error with writing to the WebSocket, we close the connection and remove it from the "clients" map. A chat application wouldn&apos;t be complete without a pretty UI. We&apos;ll create a simple, clean interface using some HTML5 and VueJS. We&apos;ll also take advantage of some libraries like Materialize CSS and EmojiOne for some styling and emoji goodness. Inside the "public" directory, create a new file called "index.html". The first piece is pretty basic. We also pull in some stylesheets and fonts to make everything pretty. "style.css" is our own stylesheet to customize a few things. The next piece is just the interface. It&apos;s just a few fields to handle choosing a username and sending messages along with displaying new chat messages. The details of working with VueJS are beyond the scope of this article but check out the documentation if you&apos;re unfamiliar. Next create a file called "style.css" in the "public" directory. Here we&apos;ll just place a little bit of styling. As with any VueJS application we start by creating a new Vue object. We mount it to a div with the id of "#app". This allows anything within that div to share scope with our Vue instance. Next we define a few variables. Vue provides an attribute called "created" which is meant to be a function you define that handles anything you want to as soon as the Vue instance has been created. This is helpful for any setup work you need to do for the application. In this case we want to create a new WebSocket connection with the server and create a handler for when new messages are sent from the server. We store the new WebSocket in our "ws" variable created in the "data" property. The "addEventListener()" method takes a function that will be used to handle incoming messages. We expect all messages to be a JSON string so we parse it so that it is an object literal. Then we can use the different properties to format a pretty message line complete with an avatar. The "gravatarURL()" method will be explained later. Also we are using a nifty library called EmojiOne to parse emoji codes. The "toImage()" method will turn those emoji codes into actual images. For example if you type ":robot:" it will be replaced with a robot emoji. The final function is a nice little helper function for grabbing the avatar URL from Gravatar. The final piece of the URL needs to be an MD5 encoded string based on the user&apos;s email address. MD5 is a one way encryption algorithm so it helps keep emails private while at the same time allowing the email to be used as a unique identifier. To run the application, open a console window and make sure you are in the "src" directory of your application then run the following command. Next open a web browser and navigate to "http://localhost:8000". The chat screen will be displayed and you can now enter an email and username. To see how the app works with multiple users, just open another browser tab or window and navigate to "http://localhost:8000". Enter a different email and username. Take turns sending messages from both windows. 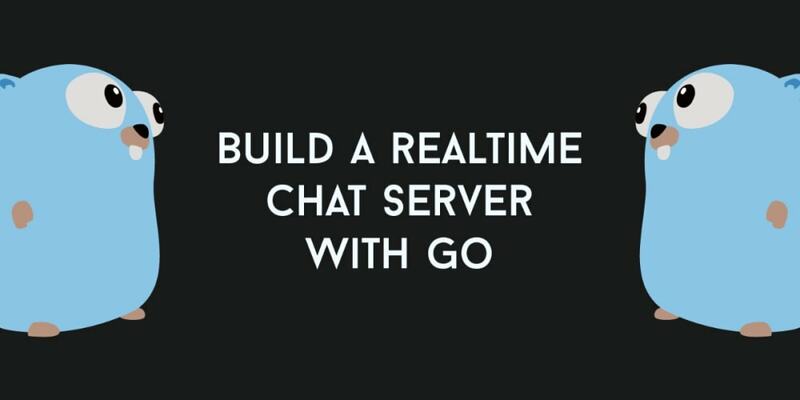 This just a basic chat application but there are many more improvements you can make to it. I challenge you to play around with the source code and add some other features, see if you can implement private messaging or notifications when a new user joins or leaves the chat. The sky is the limit! I hope you found this helpful and are now inspired to start creating your own realtime applications using WebSockets and Go.